Stanford's sacred choral music has remained one of the staples of church, chapel and cathedral choirs everywhere. 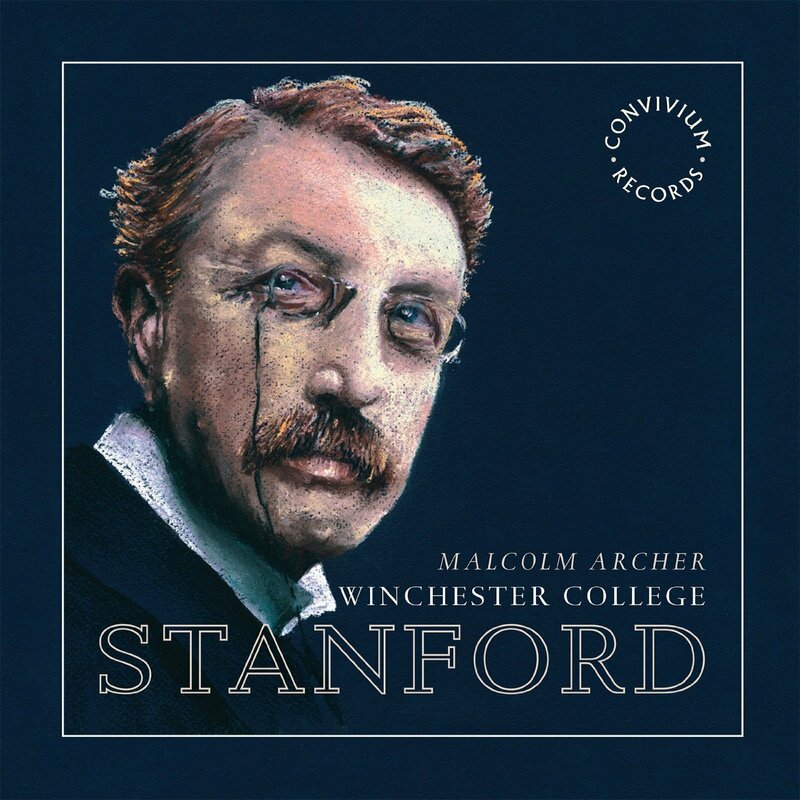 On this new disc from Convivium Records, Malcolm Archer (director of chapel music at Winchester College) directs the choir of Winchester College Chapel in a varied programme including the Benedictus and Te Deum from the Service in C, the Three Latin Motets, Op.38, and anthems For lo, I raise up, Op.145, Come, ye thankful people come, If ye then be risen with Christ and The Lord is my Shepherd. The organist is Jamal Sutton, assistant director of chapel music at Winchester College. Born in Dublin in 1852, Stanford's initial musical education was at Christ Church Cathedral and St Patrick's Cathedral. He received an organ scholarship to Queen's College, Cambridge in 1870 and moved to Trinity College, Cambridge in 1873 and revitalised the choir there. Throughout his life, Stanford returned to church music and one of the reasons why the music has remained so enduring is the outside influences he brought to it so that, for instance, his services are sometimes symphonic in their treatment. The programme on this disc is quite varied mixing sacred songs and anthems, with music from the Service in C and Stanford's late Three Latin Motets. The programme mixes the various elements up so that the three Latin motets are scattered through the disc. We open with the Benedictus in C from Stanford's Service in C which was published in 1909 and represents one of most cohesive attempts to bring thematic and structural unity to the rather diverse mix of movements in the morning, evening and communion services. Immediately we can appreciate the fine, soft-grained tones of the young tenors and basses in the choir, combined with the bright toned trebles. They are all nicely flexible in Stanford's canticle. This is followed by Beati quorum via, a six-part motet from Three Latin Motets and very much choral favourite. Here is receives a finely shaped performance, with nicely fine-grained tone. Hush, my dear, lie still and slumber is Philip Moore's adaptation of Stanford's song Golden Slumbers given a new text by Isaac Watts and here sung by the trebles with a confident solo by Angus Armstrong. The result has the gentle melodic appeal which characterises much of Stanford's work. The companion Te Deum in C comes next, and here Stanford needs all his skill to make the wordy text of the Te Deum fit a musically satisfying structure. The choir sings with robust, confident swagger and it is noticeable how much unison, or near unison, Stanford uses. Another of the Latin motets, Justorum Animae (four-part with some divisi) receives a nicely quiet yet intense opening and there is a lovely clear held top note (G, if memory serves me correct) from the trebles. A Song of Wisdom is one of Stanford's six Bible Songs written originally for voice and organ, here sung by the sweet toned trebles. Stanford wrote a set of six hymns which could each be appended to the Bible Songs so here we get the sixth hymn, the melodically appealing Oh for a closer walk with God. This is followed by one of Stanford's congregational hymns, the tune Engelberg written in 1904 for Hymns Ancient and Modern. For lo, I raise up written in 1914 is one of his most dramatic anthems. Large scale, with a substantial organ part, with its Mendelssohnian cast it can seem a bit retro for 1914 but with hind sight we can appreciate Stanford's skill and Jeremy Dibble's article suggests that some of Stanford's setting of Habakkuk's prophetic writings might be the composer dealing with the horrors of World War I. The anthem does challenge the young singers but overall their performance is truly impressive, with Jamal Sutton giving us some bravura moments on the organ. Tomas Magnusson and Oliver Tarney are the fine treble and baritone soloists. Coelos ascendit hodie is the last of the Latin motets, an upbeat double choir piece which the singers make a really perkily positive noise. Come, ye thankful people, come is a harvest anthem and a delightfully melodic little piece. If ye then be risen with Christ was written in 1883, for Easter and is based on the Easter hymn Salisbury, its extended structure brings out the symphonic nature of Stanford's musical thinking. Again, having sung quite a number of Mendelssohn's motets and enjoyed his smaller cantatas, I kept coming back to this influence. The work finishes with a glorious Alleluia which shows the choir's prowess off fully. The Lord is my Shepherd was written in 1886 and is described by Jeremy Dibble as 'one of Stanford's finest examples of musical prose' receives a beautifully fine performance. Finally we finish with Psalm 150, which was first published in the New Cathedral Psalter Chants by Novello, a another fine example of Stanford's gebrauchsmusik. The programme can seem a little disparate at first, especially as the different works are so mixed up, but I can see that the intention was to show the sheer variety of Stanford's sacred choral music ranging from the large scale English and Latin pieces through the smaller scale to the hymns and psalm tunes. Under Malcolm Archer's confident direction, this disc shows off Winchester College Chapel Choir well, in some very taxing music and the performances need no explanation or excuse. You can sit back and simply enjoy Stanford's remarkable fecundity. His style does not, of course, suit everyone and clearly he never moved with the musical times, but Malcolm Archer clearly has great sympathy with this music and I came to enjoy this disc immensely.